Connectivity conservation is particularly important in the face of climate change, as the primary means by which wildlife respond to climate change is to adjust their geographic ranges to track shifting areas of climatic suitability. Simple graphics displaying the concept of climate gradient corridors. As the climate has warmed over the past century, the ranges of diverse species have begun moving upward in both elevation and latitude. These kinds of shifts will become even more important over the coming century as climate change becomes more severe. Because landscapes are increasingly fragmented by human activities, providing a connected network of habitats for wildlife to move through as conditions change will help conserve biodiversity into the future. The Working Group is conducting a comprehensive suite of analyses aimed at identifying habitat and linkage areas that will be most likely to continue providing connectivity as climate changes, and to accommodate climate-driven shifts in species ranges. Our first analysis looked at climate-connectivity at the statewide scale, identifying climate-gradient corridors expected to facilitate species range shifts. We then stepped down our climate-gradient corridor analysis to a finer scale in the Columbia Plateau Ecoregion and the transboundary region of Washington and British Columbia. 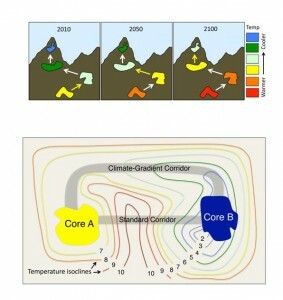 At the same time, we have also been evaluating approaches for identifying areas likely to maintain connectivity as climate changes (i.e., core habitat areas and linkages expected to see relatively little change in climate). Links to these products (and additional upcoming ones) will be made available below as they are completed. Tools developed in producing these products are also available. This project led by Meade Krosby (University of Washigton) concluded in April 2016. The project built upon the work of the Washington Wildlife Habitat Connectivity Working Group by engaging science-practice partnerships to identify potential climate impacts on wildlife habitat connectivity in the transboundary region of Washington and British Columbia, and adaptation actions for addressing these impacts. Access data gathered or created as part of the project, as well as accompanying reports describing key findings for 13 case studies (including 11 species, a vegetation system, and a region) in the Databasin project gallery. Before diving into the details, read a summary report for this effort.